One of two solar panels failed to fully unfold after the ship reached orbit, but the crew was cleared to press ahead with a normal four-orbit rendezvous as planned and the ship glided to a picture-perfect docking at the Russian Rassvet module at 10:45 p.m. EDT (GMT-4) as the two spacecraft sailed 250 miles above the Pacific Ocean west of Peru. Just before contact, the recalcitrant solar array popped open on its own. After extensive leak checks, Soyuz TMA-17M commander Oleg Kononenko, Japanese flight engineer Kimiya Yui and NASA physician-astronaut Kjell Lindgren opened a final hatch and floated into the station at 12:56 a.m. Thursday, welcomed aboard by Expedition 44 commander Gennady Padalka, Mikhail Kornienko and NASA astronaut Scott Kelly. Launched to the station March 27 aboard the Soyuz TMA-16M spacecraft, Kelly and Kornienko are four months into a nearly yearlong mission, participating in experiments to learn more about the long-term effects of weightlessness, space radiation and other aspects of the space environment. 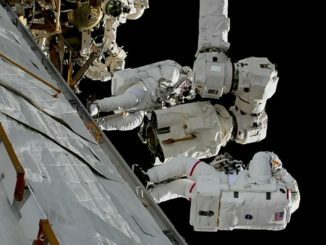 Kononenko, Yui and Lindgren plan to spend the next five months aboard the lab complex, carrying out a full slate of scientific experiments before departing in late December. Yui and Lindgren are making their first space flight while Kononenko logged 391 days in orbit during two previous station visits. “Daddy … was that the ride of your life?” one of Lindgren’s two young sons asked during a post-docking video conference. The flight got underway at the Baikonur Cosmodrome in Kazakhstan at 5:02:45 p.m. (3:02 a.m. Thursday local time), two months later than originally planned because of the April 28 failure of a slightly different booster carrying a station-bound cargo ship. 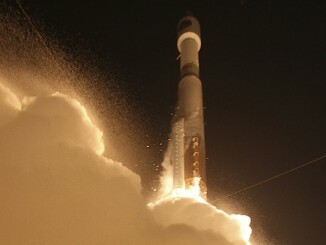 As with all flights to the station, the latest launching was timed to coincide with the moment Earth’s rotation carried the pad into the plane of the lab’s orbit. At liftoff, the station was about 860 miles ahead of the Soyuz to the northeast, moving away at more than 17,000 mph. Setting off after their fast-moving quarry, Kononenko monitored the computer-controlled ascent from the center seat of the spacecraft’s cramped command module, flanked on the left by Yui and on the right by Lindgren. Live video from the cabin showed all three strapped tightly in place, relaxed and smiling as the rocket thundered skyward. There were no obvious problems during the climb out of the lower atmosphere and eight minutes and 45 seconds after liftoff, the TMA-17M ferry craft was released from the booster’s third stage. Moments later, navigation antennas and one of the spacecraft’s two solar arrays unfolded as planned but the left-side array did not fully deploy. 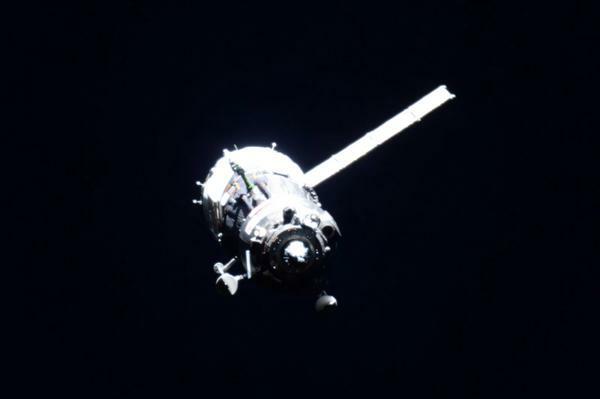 A similar glitch occurred during a September 2014 Soyuz launch, but that crew had no problems reaching the space station and Russian flight controllers told the TMA-17M crew to proceed as planned with a four-orbit rendezvous. In the nine minutes it took the ship to reach orbit, the space station had increased its lead to more than 2,400 miles, flying in a slightly higher orbit. But the Soyuz quickly closed the gap and moved in for an automated docking at the Russian Rassvet module five hours and 42 minutes after launch. 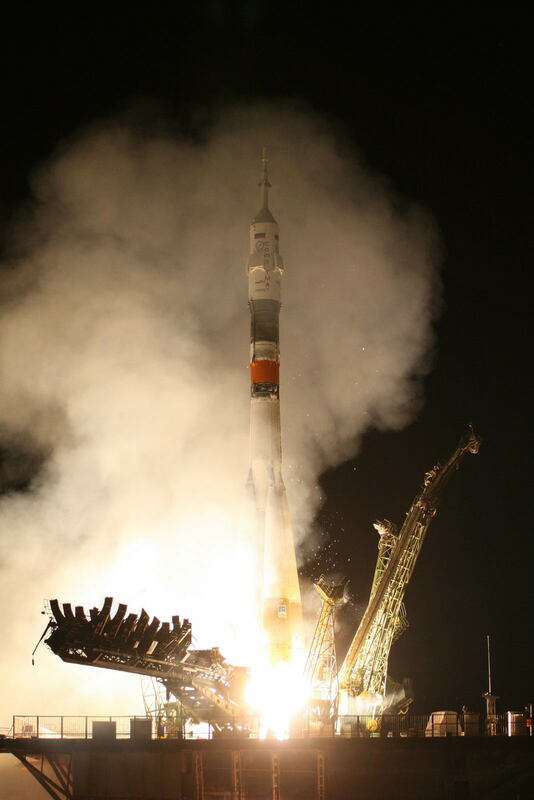 Kononenko, Yui and Lindgren originally were scheduled for launch May 26, but the April 28 failure of the Progress M-27M/59P cargo ship launch threw a wrench in the carefully scripted space station crew rotation sequence. A malfunction of some sort occurred in the booster’s upper stage that sent the cargo ship spinning into the wrong orbit, apparently damaging the freighter’s propulsion system in the process. Flight controllers attempted to regain control but they were unsuccessful and the spacecraft plunged back into the atmosphere and burned up on May 8. In the wake of the mishap, Roscosmos, the Russian federal space agency, delayed the return to Earth of three station fliers and the launching of their replacements — Kononenko, Yui and Lindgren — pending the results of a failure investigation. While the Soyuz booster used for Progress launches is slightly different from the version used for manned flights, there were enough similarities to warrant a thorough review. The Russians never revealed the details of their investigation or an explanation of exactly what might have gone wrong, but they said they had identified the most likely problem and that it would not affect the manned version of the rocket. NASA managers briefed on the review said they concurred with the decision to proceed with the TMA-17M launch. For his part, Lindgren said he had no doubts about the safety of the mission. The crew Lindgren and his colleagues are replacing — Soyuz TMA-15M commander Anton Shkaplerov, European Space Agency astronaut Samantha Cristoforetti and NASA astronaut Terry Virts — returned to Earth on July 11. 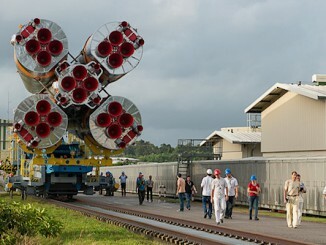 The Russians then successfully launched another Progress cargo ship on July 3 to clear the way for the TMA-17M launch.